I love Ebay. I’m always amazed at the stuff ( junk) people buy. And what they pay for it. Now don’t get me wrong. I really do love Ebay and I’ve bought my share of stuff (junk) at some ridiculous prices. And I’ve sold some. With that said, I admit I get giddy when I find things on Ebay containing my surnames. I’m always looking for Family Bibles hoping that there will be one that belonged to one of my ancestors. Rather than go through hundreds of new Bibles or Bibles with no genealogy information I just put “family bibles and genealogy” in the Ebay search engine, so the results are minimal. So far I’ve never found a Bible for any of my families, but I keep on hoping and keep on trying. 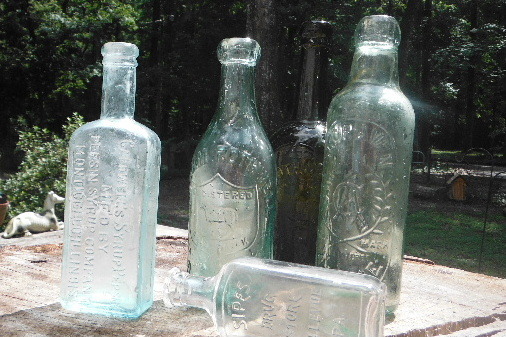 Antique bottles from the early part of the last century will usually have embossing on them and humans being forever vain put their family names on their products. I’ve found bottles with Caldwell, Rothwell, Shrader, Sipe, and Craven. I got a cigar box or most of a cigar box (no lid) with Sipe on it. That was a rush. But by far the most exciting thing I ever got on Ebay is a muscle shirt with Chidlow on it. Now Chidlow is the name of a town in Australia, near Perth. The story is that two brothers stopped there in their travels, dug a well, settled down and the area became known as Chidlow’s Well. These days it’s just called Chidlow. Through a Chidlow in Virginia I’ve got pictures of some of the Australian Chidlows. Don’t know yet if they are related to my husband’s family but they all sure have the same nose. 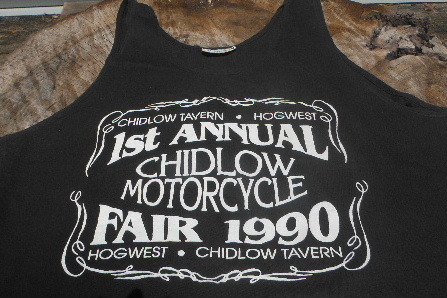 The muscle shirt was to commemorate a Motorcycle Fair in 1990 at the Chidlow Tavern. I would have paid just about anything for it but I was lucky to win the auction for $4.50 US. However I had to pay $25 for shipping. Yeah, they got me. Of course there is no connection between any of the people’s names on my bottles and my actual family. The possibility is slim to none. Now the cigar box has more promise. The Pennsylvania Sipes and the Virginia Sipes are related several generations back but I haven’t tried to find out what that relationship is yet. The thrill of seeing a family name on a bottle, post card, cigar box or muscle shirt is a fun sidebar to the craziness of genealogy. So next time you are on Ebay looking for another salt and pepper shaker to add to your collection, give your family surnames a search and see what pops up.